2. Kitchen islandThe breeze-block front on this kitchen island adds a decorative touch to this clean-lined and minimalist space. “Our client came to us with a love of textiles and the Palm Springs influence, and they asked us to work this breeze block into the addition,” says Sally Wilson of SW-Architects. 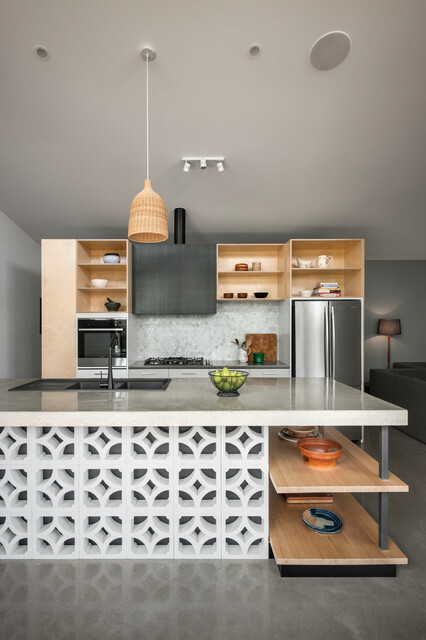 Wilson used the block for the kitchen island to create a hard-wearing foothold for the clients’ children.“Breeze blocks are a fantastic masonry element to work with,” Wilson says. Because internal masonry doesn’t need the same large mortar joints as external masonry, she recommends “keeping the detailing thin and crisp to avoid too much bulk”. 4. Breeze blockEveryday breeze blocks have been used to add bold, geometric pattern to this kitchen, while their open design keeps the kitchen feeling airy and light. The breeze-block front on this kitchen island adds a decorative touch to this clean-lined and minimalist space.“Our client came to us with a love of textiles and the Palm Springs influence, and they asked us to work this breeze block into the addition,” says Sally Wilson of SW-Architects. “Breeze blocks are a fantastic masonry element to work with.” Because internal masonry doesn’t need the same large mortar joints as external masonry, she recommends keeping the detailing thin and crisp to avoid too much bulk. 8. Location: Adelaide, SADesigner: sw-architectsFeatures: Breeze blocks make an impact in this cool kitchen.